Balloon Fiesta, Lodging guide in Albuquerque. The Albuquerque International Balloon Festival is an almost 50-year-old tradition that fills the sky of New Mexico with the magic and colors of hot-air balloons. For 2014, the festival will take place from October 4-12. 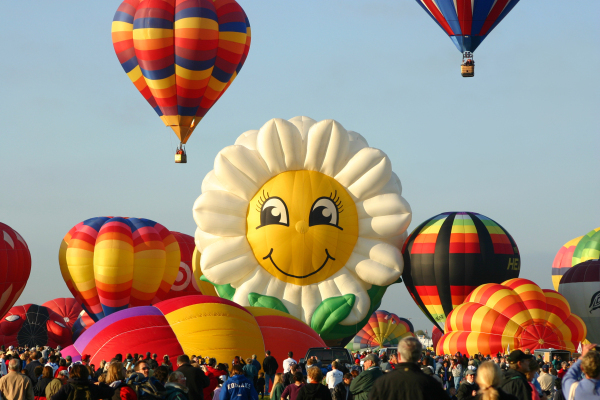 Expect to see over 500 balloon launches in the largest balloon festival in the world. The 78-acre launch field will fill the blue New Mexico firmament with a gorgeous display of color and movement. If your group is planning to enjoy this iconic celebration of flight, then we want to help you select the best hotels for groups in the Albuquerque area, and point out a few tips that will make your group trip to Albuquerque a total success. Nicely appointed and extra comfortable, this hotel has very large rooms in double configuration. As an added value, the hotel offers a large complimentary breakfast, which is super convenient during festival week when most restaurants have waits of one hour or longer. A super value for group travelers, this hotel also has a free breakfast and many other group-friendly amenities including free parking. Several hotels will be offering free shuttles to the launch field. Contact your Groople hotel specialist to help you find the best hotel for your group. Or select here to see our listing of featured hotels in Albuquerque.